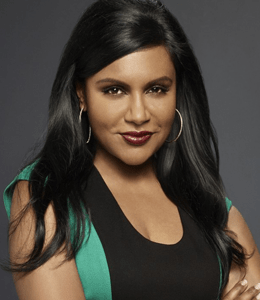 Twitter star Mindy Kaling Famous actress, comedian, writer, producer and director Mindy Kaling was born on June 24, 1979, is an Indian American actress by ethnicity. She has been referred to as Mindy ever since her mother was pregnant with her when her parents were living in Nigeria. Mindy's parents were already planning to move to the United States and wanted a "cute American name" for their daughter, and liked the name Mindy from the TV show Mork & Mindy. The name Vera is the name of the "incarnation of a Hindu goddess." Mindy with 5 feet 3 inches height and around 150 pounds weight, was in born in Cambridge, Massachusetts, to a Tamil father and a Bengali mother, both from India. Her father Avu is an architect and her mother Swati Roysircar was a gynecologist. Kaling graduated from Buckingham Browne & Nichols, a private school in Cambridge, Massachusetts in 1997. She attended High School with Boston sports talks radio show host Mike Salk. The following year, she entered Dartmouth College, where she was a member of the improvisational comedy troupe. Kaling graduated in 2001 with a BA in Playwriting. The property holder 15 million US dollars, Mindy is also a co-executive producer, director, and writer of several of the show's episodes; she also wrote, executive produced and directed various episodes of The Office. In 2003, she portrayed Ben Affleck in a play called Matt & Ben, which she also co-wrote with her best friend from college Brenda Withers. The play was named one of Time magazine's "Top Ten Theatrical Events of The Year Her major, TV appearances include Curb Your Enthusiasm, Comedy Death-Ray, Saturday Night Live. Kaling first joined The Office as a writer at age 24 as the only woman on a staff of eight and then took on the role of character Kelly Kapoor. She has written at least 22 episodes including "Niagara," for which she was co-nominated for an Emmy with Greg Daniels. Kaling who debuted in The 40-Year-Old Virgin in 2005 has performed in many films including Unaccompanied Minors, License to Wed, Night at the Museum: Battle of the Smithsonian, Despicable Me to This Is the End in 2013. She used to maintain a blog called “Things I’ve Bought That I Love", which re-emerged on her website on September 29, 2011. She is the author of the comic memoir Is Everyone Hanging Out Without Me?—a collection of essays about her early life and career. Kaling, who tweets on https://twitter.com/mindykaling, is also a Twitter star. Mindy Kaling currently has over 2.3 million Twitter followers. When Bookish asked Kaling about her tweeting habits, she said, “I can’t get in every idea I want on [The Mindy Project] no matter how hard I try to bully the other writers. [Tweeting is] a way of me getting out other comic ideas and immediately getting feedback.” She was rumored dating The Office co-star B.J. Novak in 2006. Despite the fact that their characters have had an on and off-again relationship, the rumor was never confirmed. As of October 2011, it was reported that her boyfriend was web analyst and improv actor David Harris and they had been dating for over two years. They apparently liked to keep their relationship out of the tabloids, hence the reason for the question mark. Who knows if they're still dating?